Let the record show that in my office pool I predicted all four of the teams in Final Four. Not that it took a lot of skill to go with all of the 1 and 2 seeds, but I digress. Lets take a look at each team's odds at winning the big trophy. Wait, is there a trophy? One would assume. At the very least they can cut down the nets. That's a memory that will last a lifetime. Lord knows they always seem to make it pretty far in the tournament. But can I speak frankly for a second? No one outside of Southern California knows any of their players. C'mon now. That damn Pacific time zone renders all West Coast teams virtually anonymous to the rest of the country. All I know is every time they make it this far, we as a society are cruelly exposed to numerous crowd shots of Bill Walton. Get over yourself Walton. Isn't there a Grateful Dead concert you should be at? These guys are athletic. Which translates to 'they don't have any white guys'. 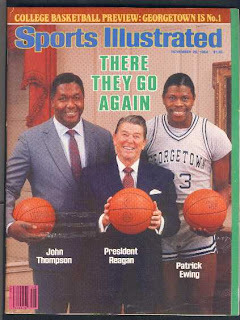 What they do have is Patrick Ewing's son! And apparently the support of the late Ronald Reagan. I don't like Ohio State per se, but I will be casually rooting for them (even though I picked Florida to beat them in my office pool) based on the fact that they're in the Big Ten and they're the one team of which I am actually somewhat familiar with. What a matchup vs. Georgetown. Patrick Ewing's son vs. Robert Parish. As a quick aside, the Buckeyes are really good on NCAA March Madness for Xbox and I really enjoyed my few games at the controls. For that reason alone they have my halfhearted support. How hard is it to repeat in college basketball? I dunno. Why don't you ask Bill Walton? He's right there in the crowd. Florida seems to be the logical choice and I've always been nothing if not a logical man. If they win, I win $100, which one could surmise I will donate to my favorite charity. Unfortunately if Florida wins, we may all have to witness the sequel to this. God help us all.